Depth 90'-120'. Northernmost reef on the west side. Most people Cozumel Underwater Diving from 70'-90'. Experience level. Expert, due to strong currents and danger of being lost at sea. Located on the north end of the island, this reef area can be dangerous to dive if current is running fast. There are few other boats there, if any. Because of the severity of conditions, the Port Captain monitors and restricts tourist diving in this area heavily. Rough conditions both topside and below at reef levels are not conducive to recreational divers on a regular basis. Expect to descend, dive, and ascend as a group. If one diver gets separated, the dive should be aborted. Divers have been lost forever doing this dive. Carry a safety sausage. Expect large swells when you surface. Once on an Aldora boat during our Cozumel Dive Trips our captain, Marcello, was looking off towards the north as he was picking us up, and noticed a safety sausage about 2 miles away. We went to investigate and found a lone diver who had been drifting away from the island for over an hour. We picked him up and he was extremely grateful. We found his boat about 4 miles away, drifting with a broken engine. During your Caribbean Dive Vacation, make sure your dive operator has worthy boats or dual engines. It is difficult to photograph the animals here, as the current is usually very fast. You might see an Eagle Ray or two. There are usually lots of Turtles. 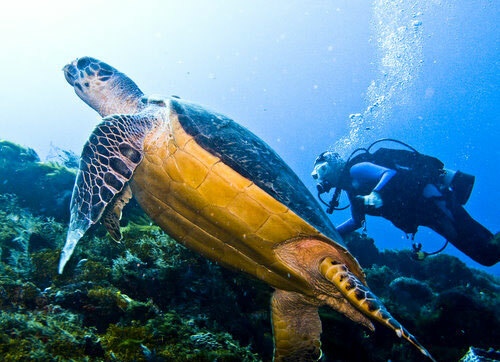 The Reefs of Cozumel is very deep and consists of a rocky ledge that drops off to the blue. There are a few overhangs where you can rest and wait for the group. 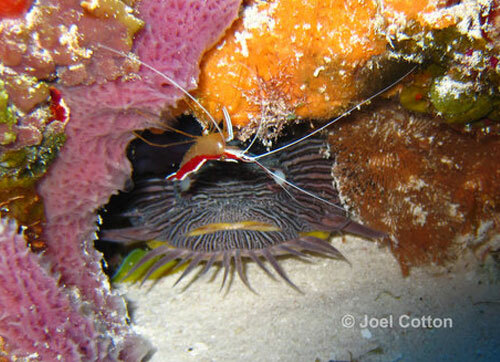 Look for lobster, crabs, and Cozumel Splendid Toadfish, as well as the usual French Grunts. 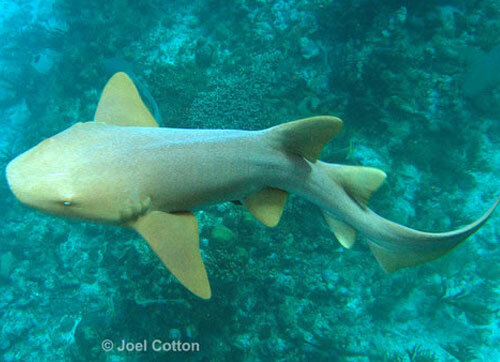 You'll see Turtles, moray eels, and Nurse Sharks fairly often. At the end of the dive, you will usually degas at about 50' depth. You are far above the coral. If conditions are murky, it can be very disorienting to fly through the water without any real points of reference. 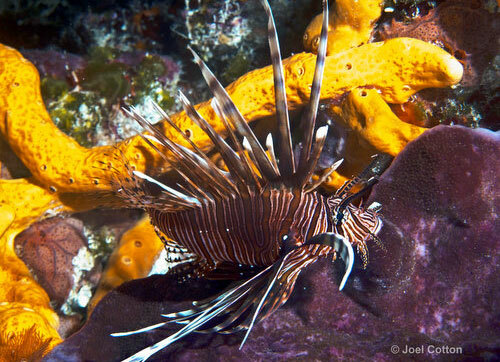 Keep an eye on your gauges and follow your Cozumel Reef Guide.